It is always really enjoyable to visit a place so isolated - no way to come by car! We were mesmerized by the colors and their contrast: the water is emerald and dark blue, the mountains brown and orange while the buildings are mostly white. As you can see in the picture below, the mix is a success ! You will find people saying on the Internet that it is not interesting and not worth going because it is not a traditional fishing village anymore. This is true, all buildings are now tourist accommodations and restaurant. 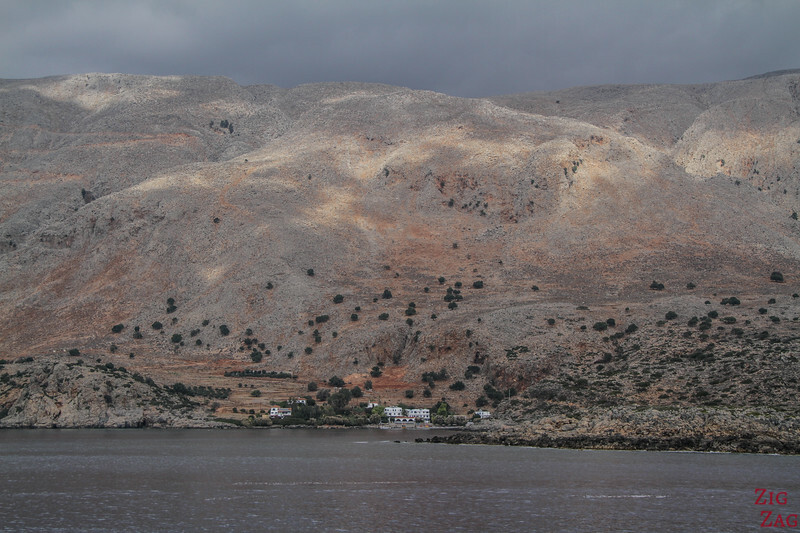 But I still think this is one of the most beautiful corners of Crete in term of landscape and it deserves a visit. 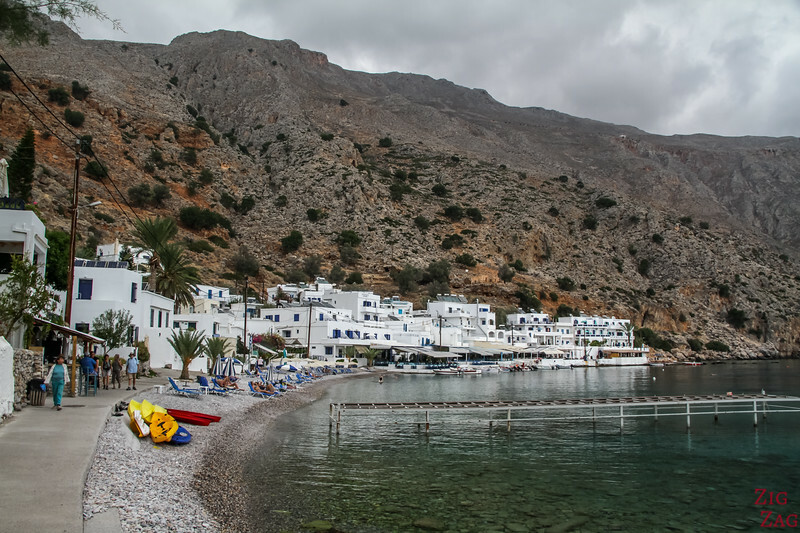 Where is the village of Loutro in Crete? 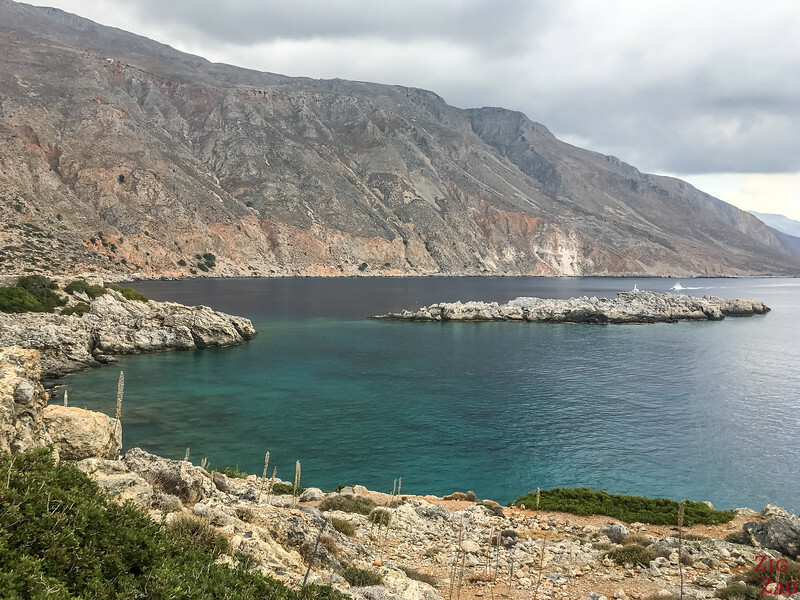 How to get to Loutro Crete? 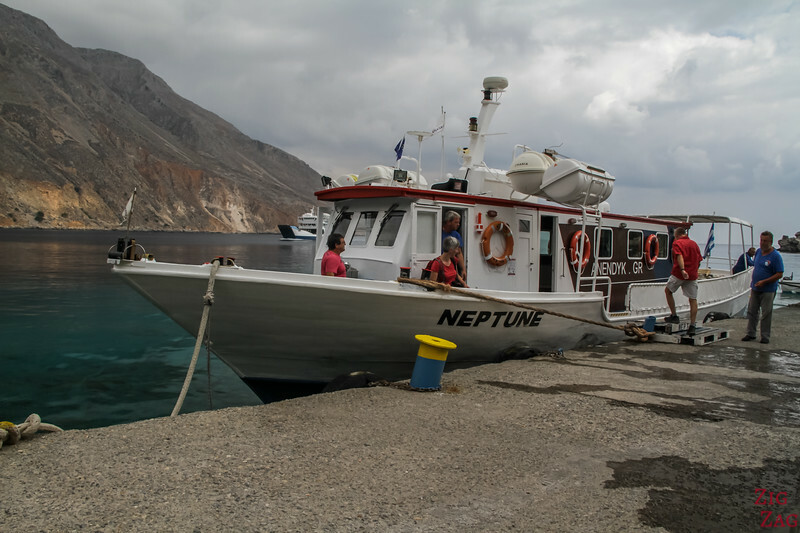 Several companies are operating boats between Chora Sfakion and Loutro in Summer. However the biggest one with frequent transfer in Summer and transfer in Winter is Anendyk. 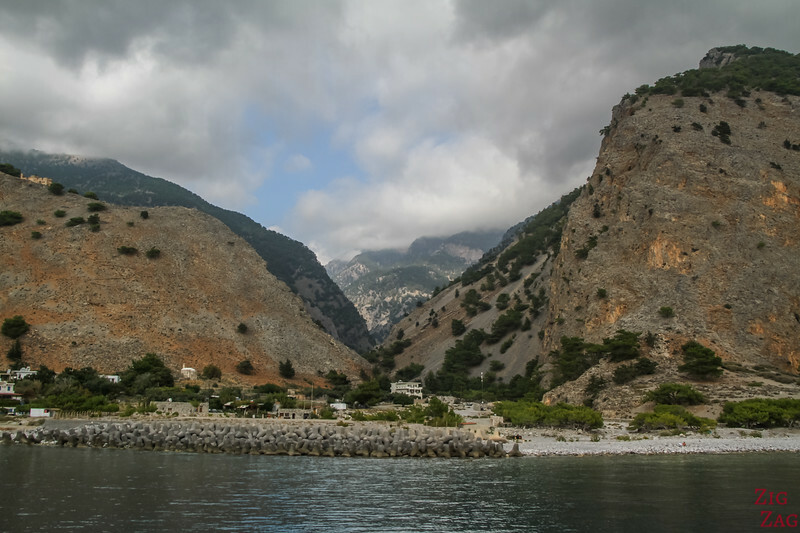 Plus they also operates to Agia Roumeli (Bottom of Samaria Gorge) and all the way to Palaiochora, so you can explore more. On the picture above and below, you can see their largest ferry. This is the first one in the morning leaving Chora Sfakion. There is plenty of seating outside and a little bit of seating inside. 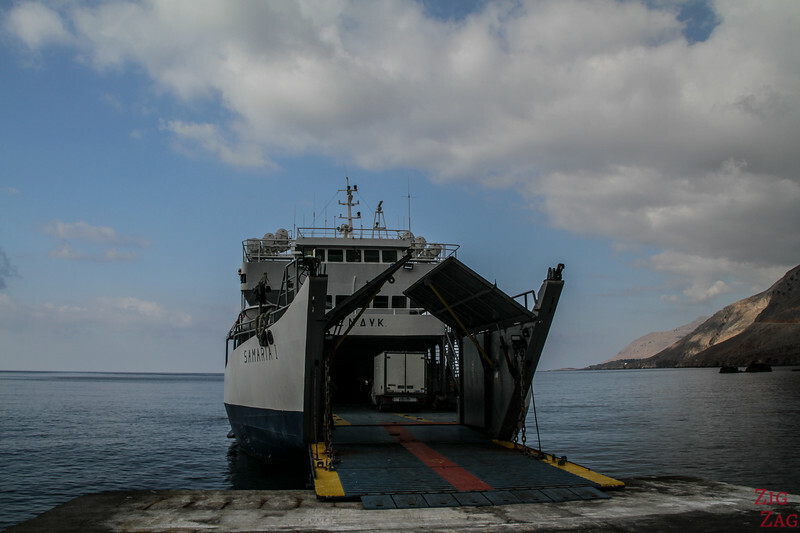 You can find the Timetable of the ferries HERE. You can purchase your ticket at the tickets at the port. Below is a picture of the booth. The boat ride is quite enjoyable with views of the mountains dropping into the sea. You first get a better view of the charming village of Chora Sfakion (also written Hora Sfakion) as you can see in the picture below. This is the main town of the area, but not a big one! Further you can notice a small beach with a few trees. 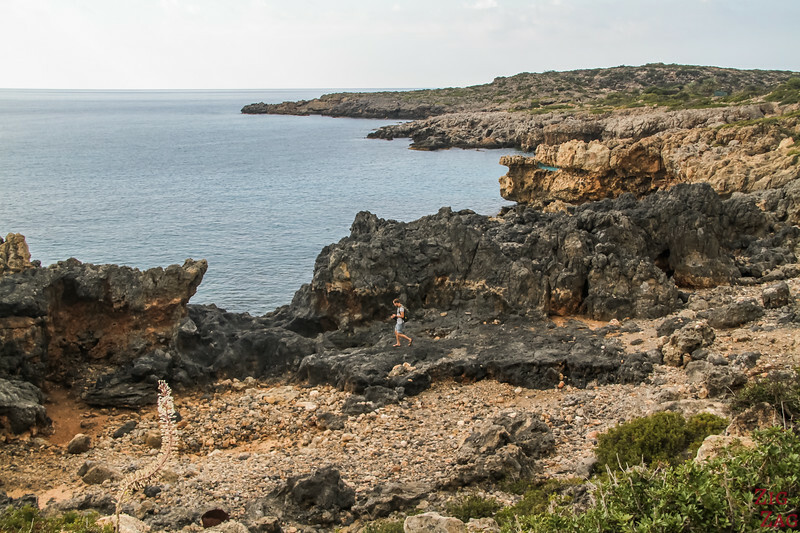 This is Glyca Nera also called Sweet Water Beach. 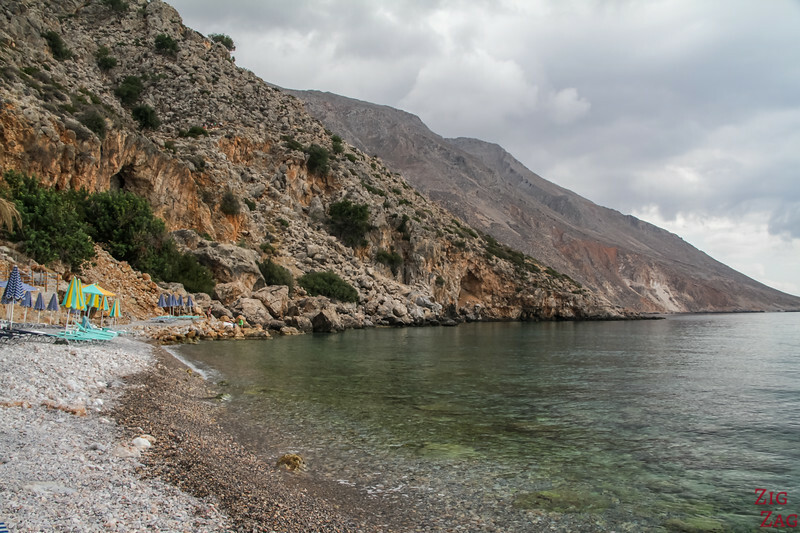 A small boat from another company can take you to this beach from Chora Sfakion. The particularity is that fresh water flows to the beach and then through the pebbles. 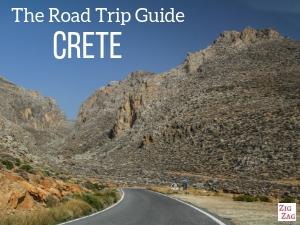 Can you understand why this was one of my favorite boat tours in Crete? 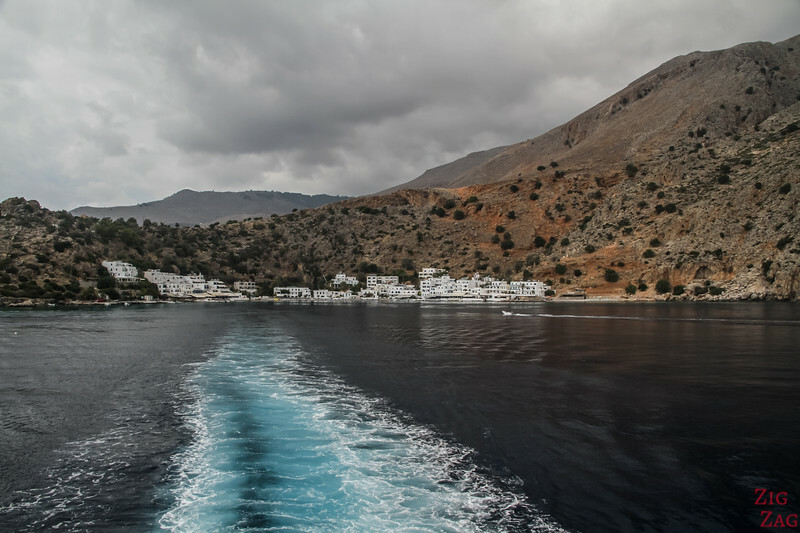 At other hours, the ferry between Loutro and Chora Sfakion by Anedyk, maybe a smaller boat such as the one you can see in the picture below. Its comfort is fine too. The ride is quite short, you don't get bored with the beautiful views. And then you notice a little white point in the distance. Getting closer you notice it is the village with white houses in a little cove. 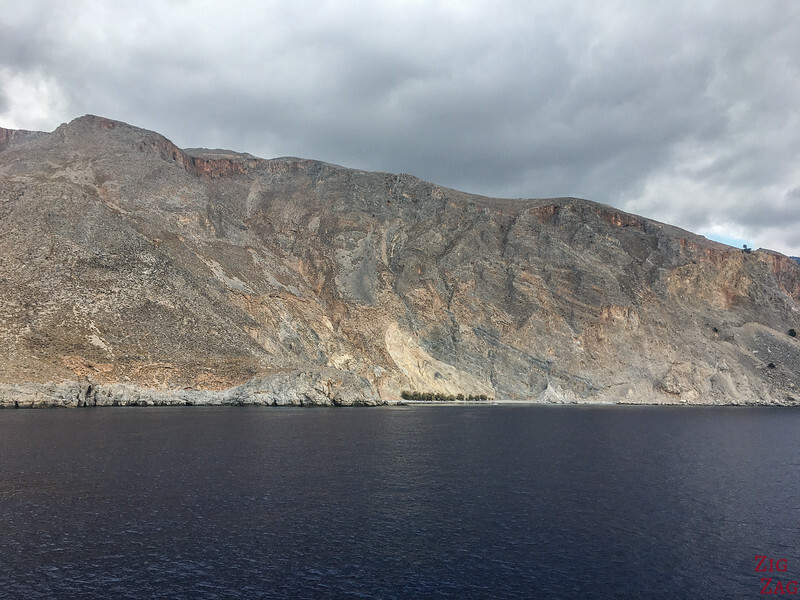 The cliffs above are 600m high. It is a really small village as you can see but it has been inhabited for a long time. Because of its natural harbor for all seasons, it was a good place for a settlement. 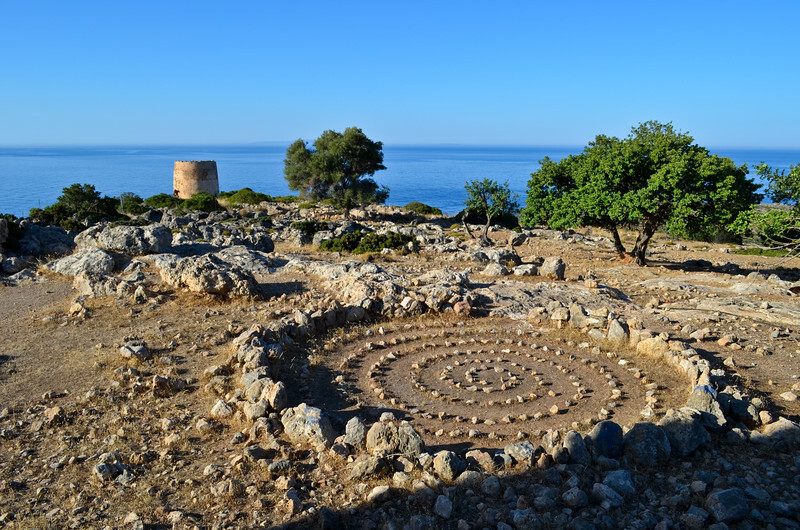 It was the site of the ancient city of Phoenix (Finikas), which flourished during the Hellenistic and Roman times. 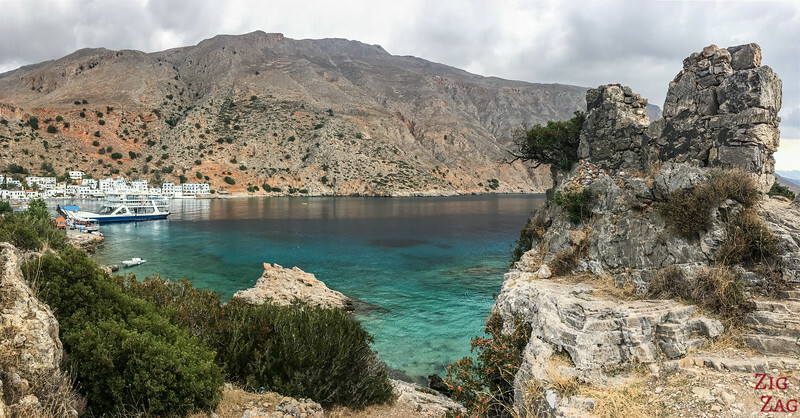 Today the next bay is called Finikas; it was one of the 2 ports. The ancient city has not been excavated but it was mentioned in Paul's voyage to Rome (for those interested in religious history). 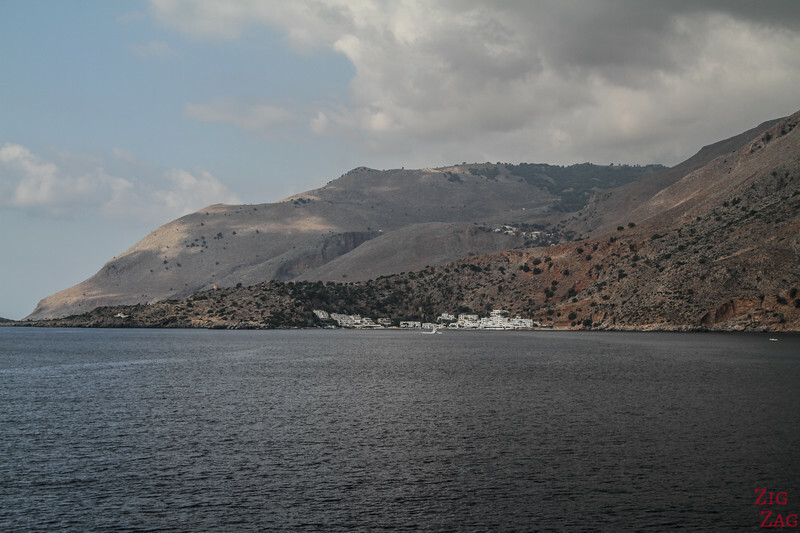 Later pirates used to Loutro to attack ships sailing along the South of Crete. But the Venetians took over and fortified the village. Later, the Turks also added fortifications. As I wrote before, the water is always calm in this natural harbor. It is because it is facing East and has an island closing the bay. There are 2 beaches. But be aware, there are quite small for the quantity of tourists! The first one is in the middle of the village (pictures above and below). It is made of small pebbles and lined up with sunbeds. I think it is the better beach with a little bit of sand and a flat lying area. Or you can continue to the end of the village where the hiking trail start. You can find another small beach. It is also made of pebbles and has sunbeds; However it is not as flat and even smaller! Note: if you go snorkel in the area you might spot turtles. 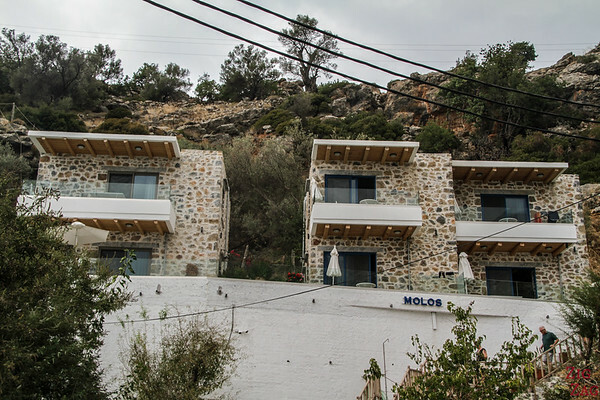 Nowadays, the whole village is only accommodations and restaurants for tourists. You have a large choice and you are always close to the water! There is lots of fresh fish and good salads to be enjoyed for lunch or diner. Spending a night in such an isolated place can be qui a great option, although in Summer the vilalge can be a little loud when it is full of tourists. You won't find a large resort with swimming pools. 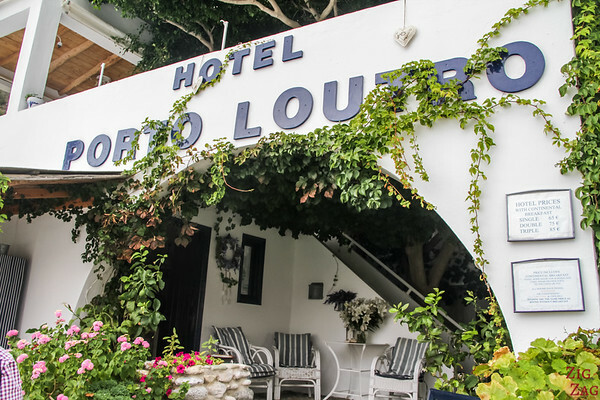 All accommodations are small hotels or rentals. Note that if you stay longer and are not eating at the restaurants, there are only small mini-markets in the village. You need to bring your food. 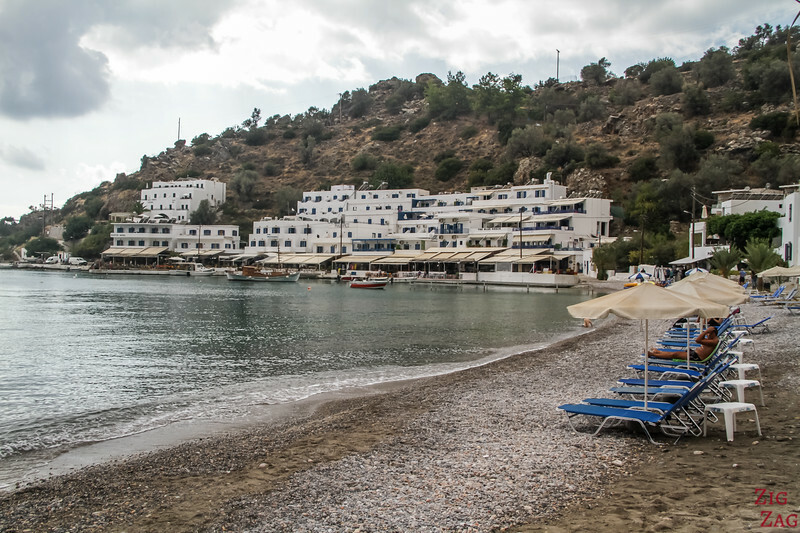 Except from enjoying the beach and eating, the main thing to do in Loutro is walk towards the West. The take path left of the pier. It is an easy walk. 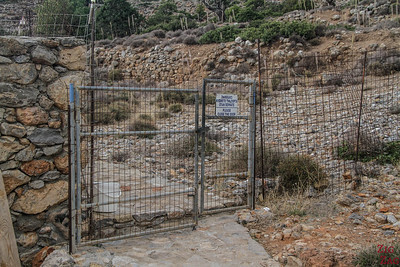 You first arrive at the ruins of the Kastella Fort. 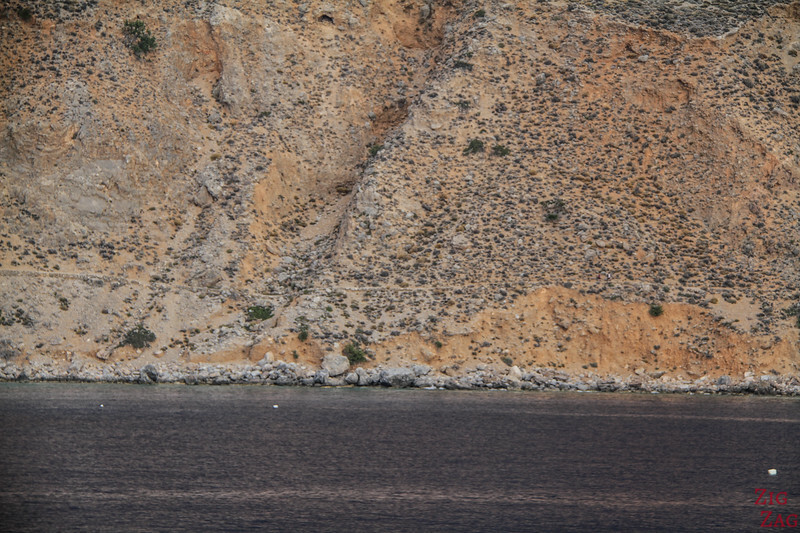 It was small and built on the cliff facing the islet Fanari of Loutro. Only the base of the ruins remain, but you can understand the strategic position it had. You can easily keep walking past the Turkish fortress. Go through the fence (but don't forget to close it back). Just a few minutes further you will reach the chapel. The path is paved up to the chapel but not further. 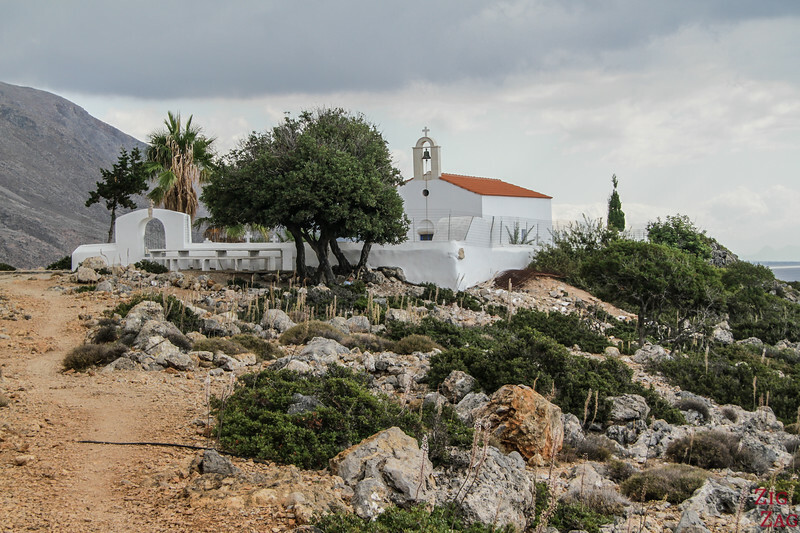 It is the church of Sotiros Christou, painted in white and surrounded by a cemetery. Continue further, the path is easy and the views are great all along the path with beautiful rock and colors. 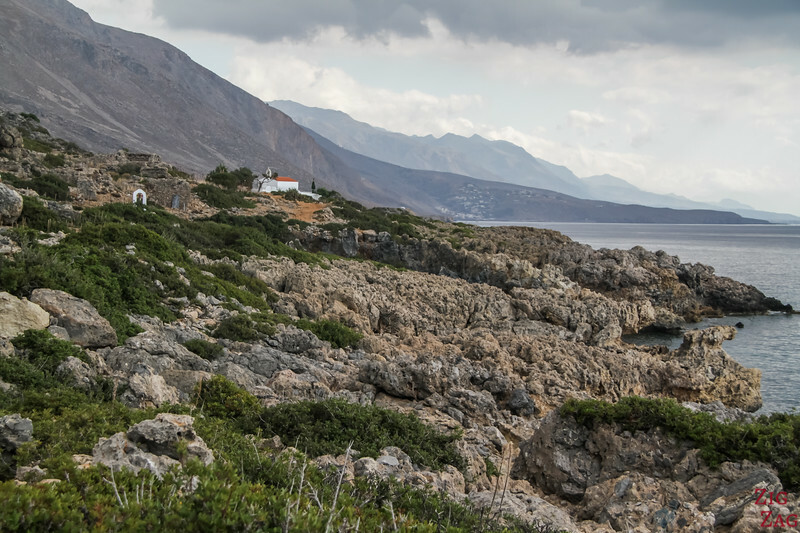 As I still wanted to go to Agia Roumeli during the day, we walked back towards the village but you can continue to the small beach of Finikas and do a loop coming back via the inland path and the Koules fort (see next section). If you are ready to climb a bit more, you can also take the old mule track. But it is very steep. 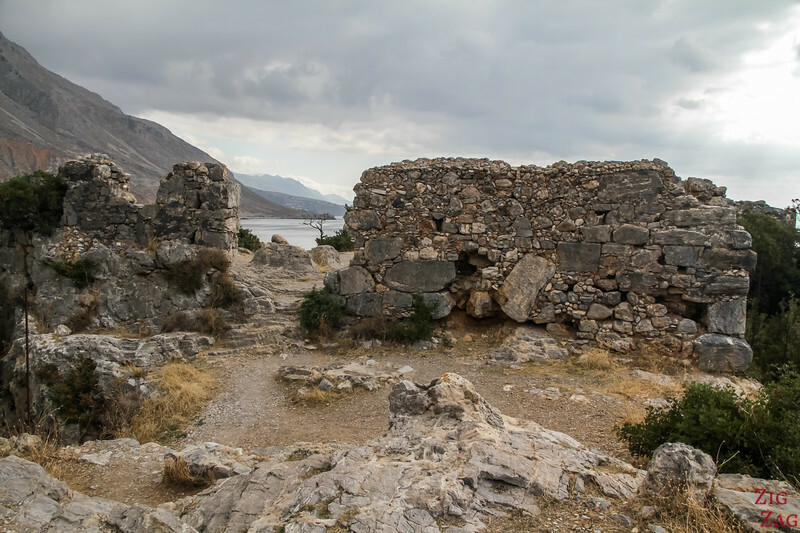 It takes you above the village, to the old Turkish fortifications where you will see the ruins of the tower and an old fort. 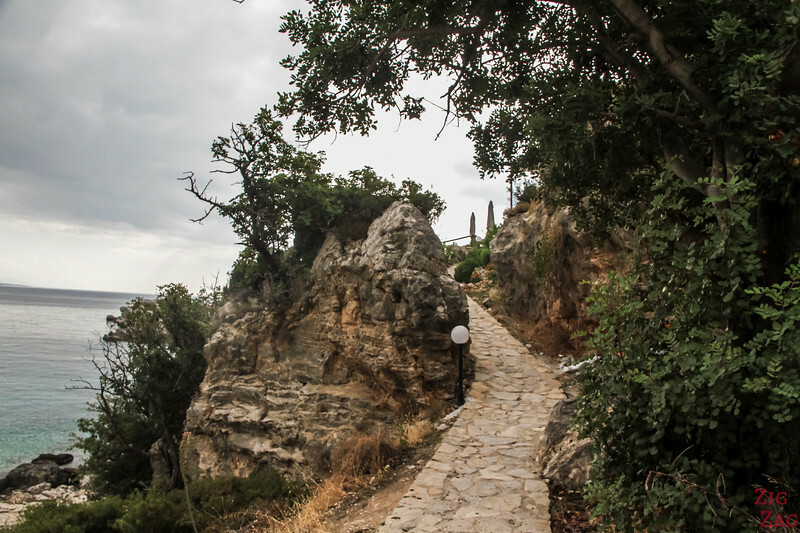 It was built after the 1866 uprising to control the harbour which the Cretans were using as a base in their revolts. 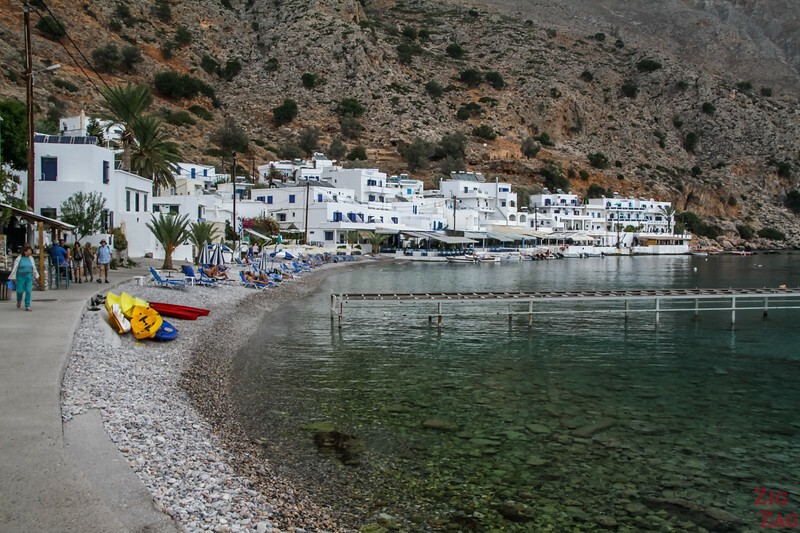 If you have decided to stay longer in Loutro, you can enjoy other beaches and walks in the area. 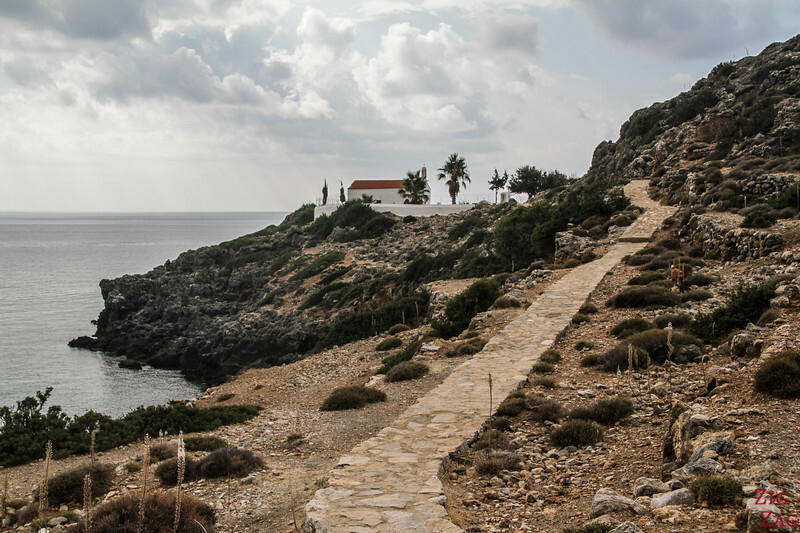 You can walk to the other side of Cape Mouri where you will find Finikas with a small beach and a few buildings. There is someone offering boat trips to the nearby Marmara beach. 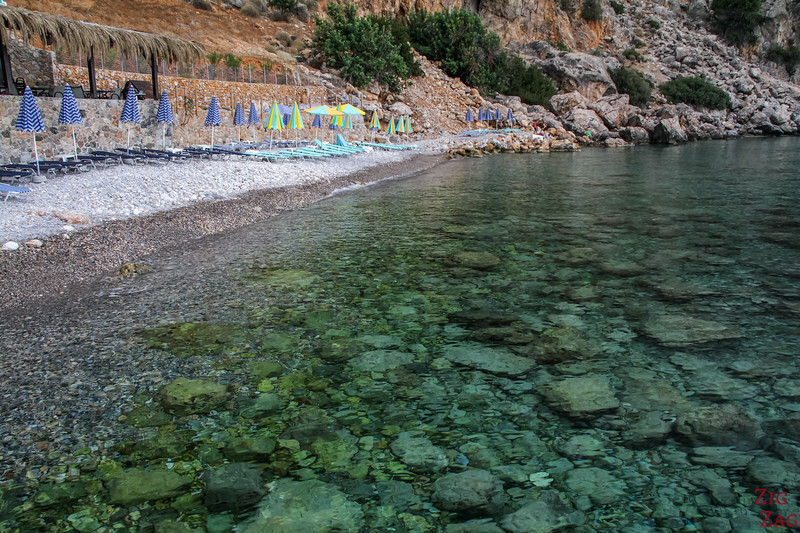 It is a small protected pebble beach with turquoise water. 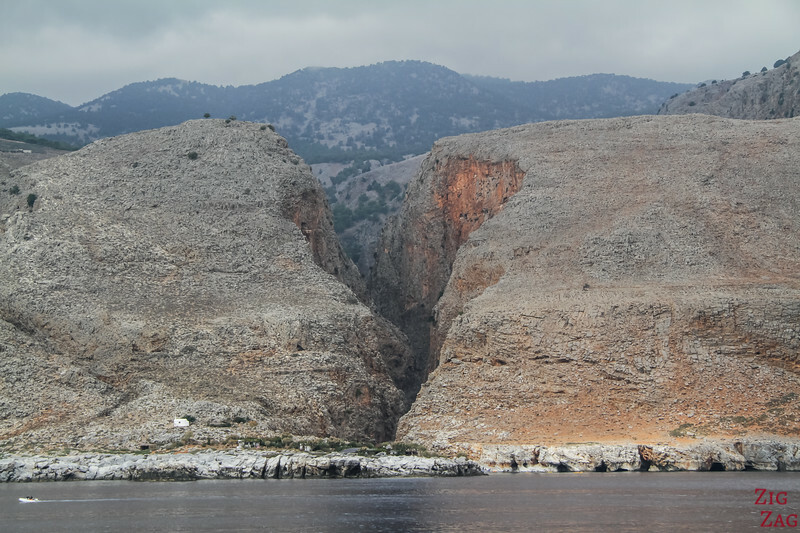 And right way you can walk and enter and impressive narrow gorge. In Summer there is a tavern on the rocks. 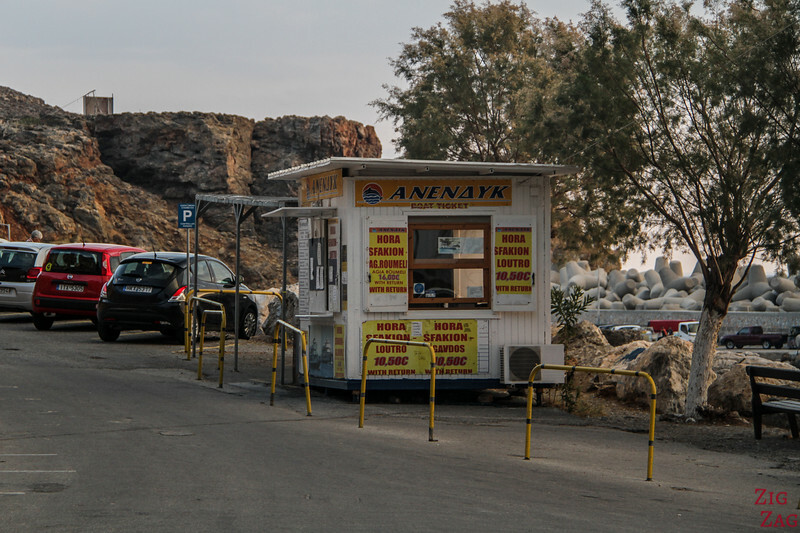 You can continue further with the Anendyk ferries and reach Agia Roumeli. It is a small village with a large pebble beach. 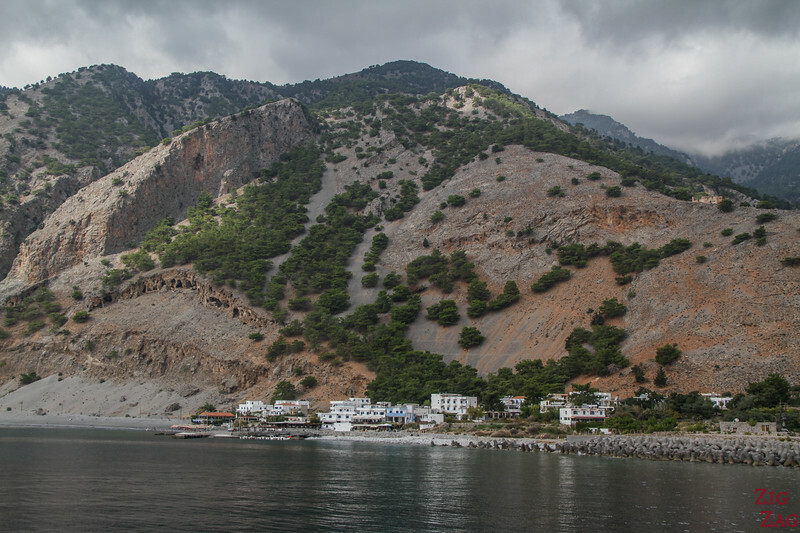 But it is famous for being the arrival point of the long Samaria Gorge hike, the most well-known on the island. 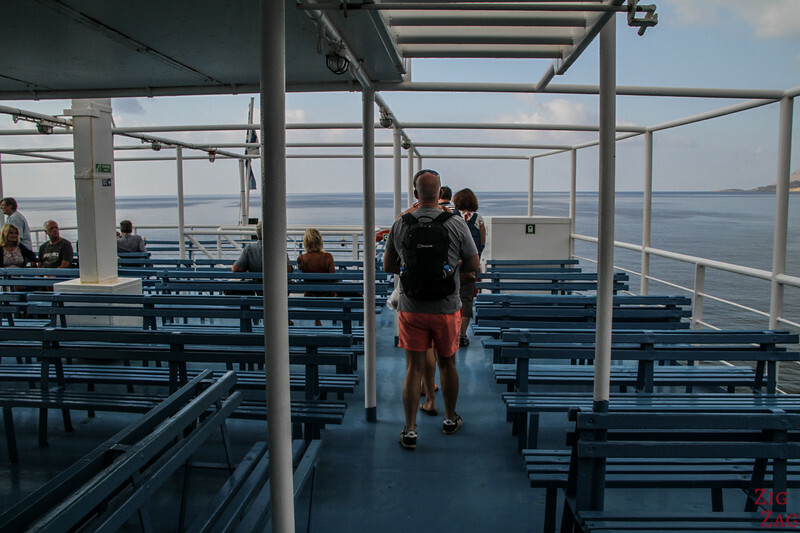 So you can take the ferry to the beach and walk part of the bottom section of the gorge with its impressive walls and narrow sections.